Robert Schmunk The Parks Department has begun placing rat poison in Tompkins Square Park, a measure it previously declined to use because of the presence of red- tailed hawks. The city has unleashed a new weapon in the fight against the rodent menace in Tompkins Square Park. After destroying rodent hideouts and deploying mint-scented trash bags, new garbage cans, and “Feed a pigeon, breed a rat” signage, this week the Parks Department began baiting the park with poison. 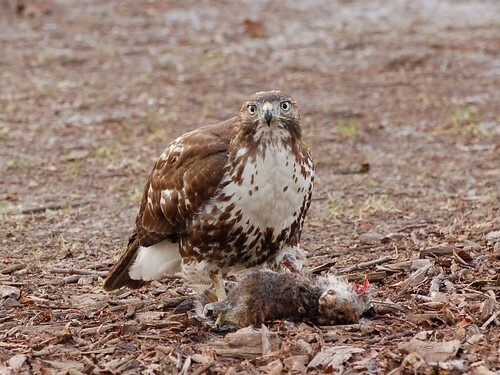 Previously, the Parks Department had said it did not use rat poison due to the danger it posed to the red-tailed hawks that dine on the critters. But now, new Parks Department policy allows the agency to use poison when hawks are not in the fledgling season, which is roughly from February to August. Glenn Phillips, the executive director of New York City Audubon, said the new policy was in line with what his organization advocated. “It seems like a reasonable trade-off between human safety and health and bird safety and health,” he said, adding that the poison being used was “sub-lethal” to fully grown hawks. 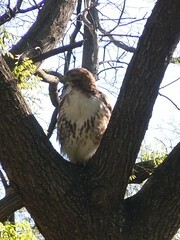 Carol Vinzant A hawk in the park earlier this year. Still, Mr. Phillips cautioned that poison — or any other anti-rodent measure — would not address the root of the well-documented rat problem in Tompkins Square Park: food discarded by careless park-goers, as well as the scores of people who line up on a daily basis along Avenue A for free meals from charity groups. “Many of those meals end up on the ground, and not in the bellies of the people they are intended for,” Mr. Phillips said. It is unclear whether the many efforts at reducing the rat population since the furor began in July have produced results. Mr. Marlow said that Parks officials told him that the rat problem at Tompkins Square Park should be under control within six months. A Parks Department spokesman would not confirm that goal. “At Tompkins, the baiting is one element of our overall strategy, which includes controlling food sources, replacing the garbage pail lids, installing mechanical traps, and installing meshing under the soil to prevent rats from burrowing,” the spokesman said. Kim DavisScenes like this one from earlier in the summer may soon be a thing of the past.